The lobby renovation is almost finished! The recently completed grand staircase connects the lobby and the second floor together for a cohesive look and feel. New lobby doors will be installed soon. The new lounge area will be furnished with soft seating and collaborative work areas. 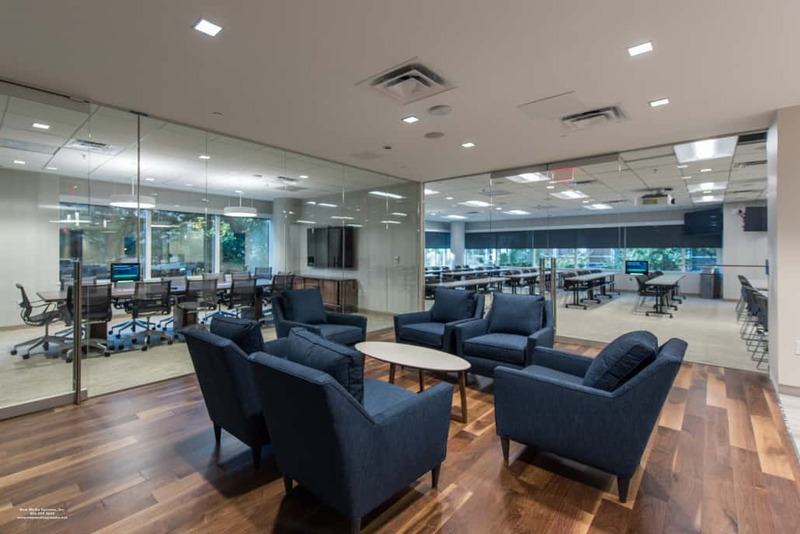 James Center tenants will enjoy this space as an informal gathering location outside of the office. The new conference center on the 2nd floor was completed in October. The conference center includes a board and multi-purpose room with an AV system and catering kitchen. The renovations of the second-floor corridor, the Skybridge and the “mirrored hallway” are very close to completion. These thoroughfares that connect all three buildings will be transformed into spaces that are modern and inviting. Conceptual planning for a facelift to the Atrium is underway. Look for work to begin during the second quarter of 2019. Stay tuned! Sesame Sushi and The Pit and The Peel are open! 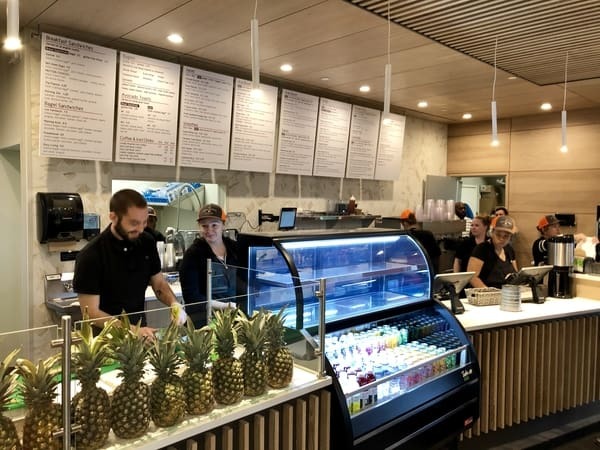 They join Arby’s in the Atrium, and collectively, there are now a variety of menu options. 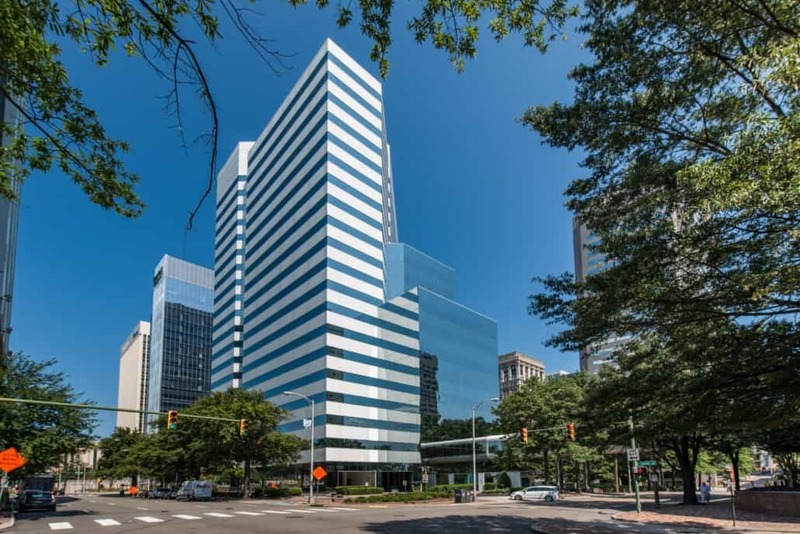 The former Wendy’s space in One James Center has been prepared to welcome a fourth restaurant (TBD). A patio has been added to the corner of 9th and Canal Streets for outdoor seating. Additionally, Experimac is now open in the Atrium! They buy, sell, trade and repair Apple products. Everyone will benefit from this convenient location. This project was completed on all three buildings this past September. The buildings glisten under the sun! 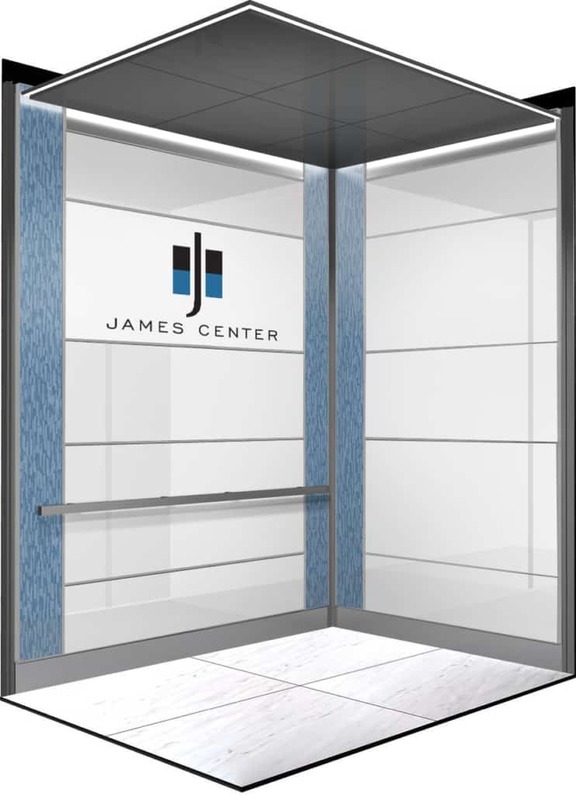 To enhance James Center’s prominence, we installed a three-tier LED lighting system at the top of Two James Center. 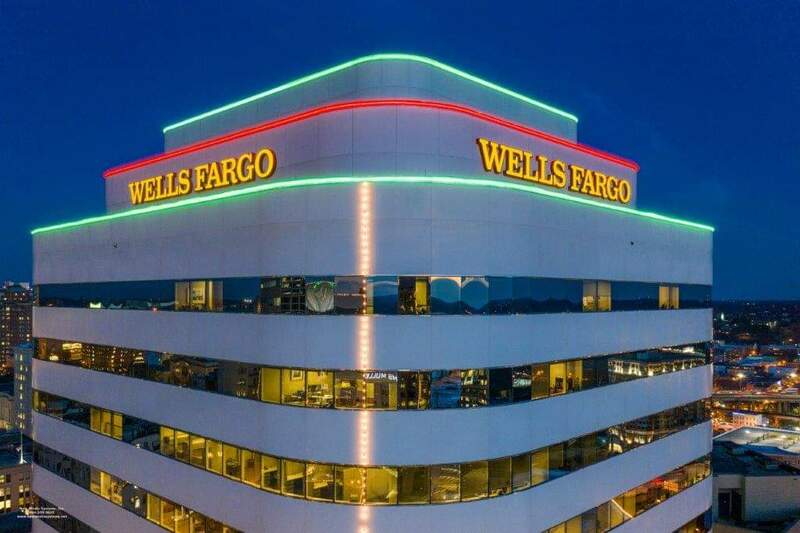 The lights are programmed through software and provide a wide range of color options and patterns. The existing lighting has been replaced with LED lights that provide a noticeably brighter indoor atmosphere. Motion sensors and dimmers provide better control through a software program, resulting in energy savings without compromising safety. The fixture replacement has been completed and will soon be commissioned with the software controls. The roofs on Two James Center, Three James Center and the Atrium have been replaced with lightly colored reflective surfaces which reduce the roof surface temperature significantly. Cooler surface temperatures reduce the workload placed on the HVAC systems, requiring less energy to operate. Insulation is being added to increase the thermal resistance, providing energy savings. The roof on One James Center was replaced in recent years. We are expanding and upgrading our CCTV video recording equipment with new technology to allow the system, access controls, and emergency intercoms to be controlled by a single software platform. We have partnered with Verizon to install a Distributed Antenna System (DAS) throughout James Center. The DAS will increase mobile coverage to Verizon customers working in or visiting the property’s interior spaces, including the parking deck. The interior of James Center will essentially become a cell site. This upgrade will increase coverage in the buildings and elevators and will offload capacity from Verizon’s external wireless network. James Center has also partnered with Mobilitie to provide DAS coverage for any other carrier who wants to be in the complex. The three-year project to modernize all elevators began this past Fall. Three elevators are currently under construction. All elevators will be greatly improved in terms of ride quality, speed, and door operation. The finishes will also be updated with interior glass panels, new flooring, LED lighting and stainless steel. James Center is currently working towards earning an Energy Star certification for all three towers. We are refurbishing/replacing air handlers and controls throughout the entire complex, as well as upgrading lighting and electrical systems. Two new chillers are slated to be installed in early 2019. With each property improvement, we are closer to becoming certified.